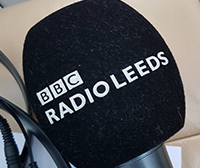 Castleford Young Musicians featured on the BBC Radio Leeds breakfast show on Wednesday 13th February. Band Director Phil Clarkson spoke about our concert band and choir, the fundraising we do (inlcuding our recent defibrillator appeal of course) and how we're on the lookout for new members. Click here to hear the interview (skip to 1:39:00). For a bonus feature on an unrelated topic with Phil and our Treasurer Richard Forster, skip to 2:53:27! After just over a year of fundraising, we were very happy to deliver two defibrillators to Carlton Lanes Shopping Centre on Tuesday 12th February, along with an indoor cabinet and a heated outdoor cabinet. A photographer from the Pontefract and Castleford Express was there to mark the occasion, so look out for the photo in the local paper in the next week or so. 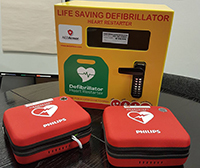 The shopping centre will now take responsibility for installing and maintaining the defibrillators, but look out for the grand unveiling once they're in situ. CYM are very sad to hear the news that former choir member Tracey Chappell passed away suddenly on 9th January. Our condolences to Graham and the rest of Tracey's family. Tracey's funeral will take place on Friday 1st February with service in Pontefract Crematorium at 1:40pm. 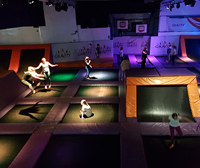 Our first meet up of 2019 was once again at Gravity, Xscape, where members enjoyed an hour on the trampolines, followed by refreshments. It was a great chance for everyone to have a post Christmas catch-up ahead of our first rehearsal on Friday 18th January and another busy year. Our sell out Christmas Cabaret Concert at the Civic Centre in Castleford on 14th December was our biggest selling Christmas concert for many years. Thanks to everyone for your support, including with the raffle - we raised a fantastic £250. This concert is our main fundraising event of the year, so once again, thank you! 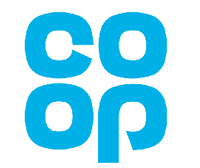 Castleford Young Musicians are delighted to have been chosen as one of Co-op Castleford's Local Causes for 2018-19. This means as a member of Co-op, you can choose CYM as your local cause and automatically donate 1% of what you have spent on selected products and services, including food stores and electricals, to Castleford Young Musicians and help boost our Defibrillators for Castleford Appeal. For more information, click here. Social media is one of the cheapest, easiest and most effective methods of promotion available to us, but we need your support! Please like and share our pages and posts on Facebook, Instagram and Twitter to help spread the word! 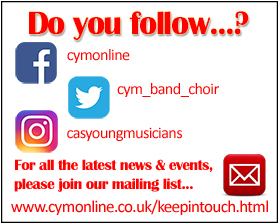 Why not keep up to date with all the CYM news and events by joining our mailing list too?! Click here to sign up. Castleford Young Musicians are always on the lookout for new band and choir members, but we're currently very keen to invite any clarinettists who may wish to join us. There are NO AUDITIONS, so if you're aged between 8 and 25 and are at least grade 1 standard please come down to a rehearsal and see what you think! Contact us for more information. 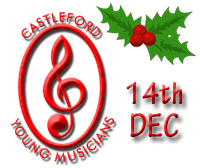 Our annual patron's scheme 'Friends of CYM' is a great way to support Castleford Young Musicians if you're not musical or you fall outside our membership age range! Memberships renew each August, but between now and the end of January we have a special half-year offer for only £5 (single membership) or just £6 (joint membership). There is no commitment from August 2019, but if you would like to continue supporting us, membership for the following 12 months will be £12 (single) and £15 (joint). This is an excellent way to help CYM with their fundraising efforts - if you're interested please complete the form on our Friends page. Contact us if you would like more information. A massive thank you to everyone who helped us achieve this in such a short time - we expected this to take a couple of years! "As President of Castleford Young Musicians, I should like to thank, most sincerely, the general public and the many benefactors who have made it possible for us to install 2 defibrillators in Castleford town centre. Your generosity will now produce a life-saving apparatus in the Castleford community." We will of course update you when the defibrillators are purchased and installed. Watch this space!